Barabbas' followers celebrate his release, with Jesus being flogged in the background. 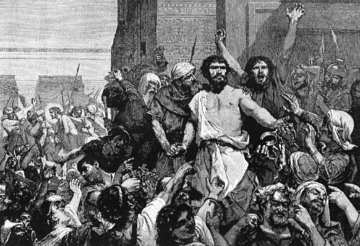 Barabbas was a Jewish insurrectionist c. 30 C.E. whom Pontius Pilate freed at the Passover feast in Jerusalem, according to the Christian narrative of the Passion of Jesus. According to some sources, his full name was Yeshua bar Abba, (Jesus, the "son of the father"). Barabbas had been charged with the crime of treason against Rome—the same crime for which Jesus was also convicted. The penalty was death by crucifixion. However, according to Christian sources, there was a prevailing Passover custom in Jerusalem that allowed or required Pilate to commute one prisoner's death sentence by popular acclaim. The crowd was offered a choice of whether to have Barabbas or Jesus released from Roman custody. According to the closely parallel gospels of Matthew (27:15-26), Mark (15:6-15), Luke (23:13–25), and the more divergent accounts in John (18:38-19:16), the crowd chose for Barabbas to be released and Jesus to be crucified. A passage found only in the Gospel of Matthew has the crowd saying, "Let his blood be upon us and upon our children." The story of Barabbas has special social significances, partly because it has frequently been used to lay the blame for the Crucifixion on the Jews and thus justify anti-Semitism. At the time it was told, the story may have served to portray Christians and Jews on opposite sides, with the Jews characterized as rebels against Rome, thus removing an impediment to Christianity's acceptance. Herod conquers Jerusalem on behalf of Rome. Barabbas lived during a time when the independent Jewish state established by the Hasmonean dynasty had been brought to an end by the unrivaled power of the Roman Empire. 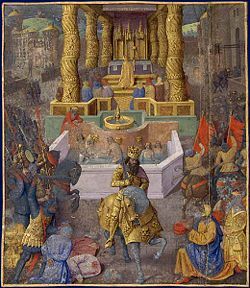 The Hasmoneans themselves had been considered corrupt by strict religious Jews, but puppet kings such as Herod the Great, who ruled on Rome's behalf, created an atmosphere of widespread resentment. The two mainstream religious parties, the Sadducees and the Pharisees, came to represent opposing poles, with the Sadducees generally controlling the Temple priesthood and the Pharisees appealing to a more popular piety. Consequently, the Sadducees came to be seen as Roman collaborators, while the Pharisees were divided in their attitude toward Roman rule. In this context, the group known to history as the Zealots arose as a party of passionate opposition to Rome, willing to use violence against these foreign oppressors to hasten the coming of the Messiah. Many looked to the promise of the Messiah for liberation from Rome. Several claimants to the title of Messiah arose in decades immediately before and after the time of Barabbas. Most of them led violent revolts in an attempt to overthrow Roman rule. The Essenes, meanwhile, prepared for the day when the corrupt Temple priesthood would be replaced by their own purified priests and the Day of the Lord would bring about the advent not only of the kingly Davidic Messiah but also the priestly Messiah, the son of Aaron. It is in this context that the story of Barabbas and Jesus is told. Jesus attacks the money-changers and merchants, while the Temple scribes observe. John 18:40 calls Barabbas a lēstēs, "bandit." Luke refers to him as one involved in a stasis, a riot (Luke 23:19). Matthew says Barabbas was a "notorious prisoner." (Matthew 27:16) However, Mark (15:7) makes his crime more specific, saying that he committed murder in an insurrection. Clearly, Barabbas was no mere robber, but was probably a leader of a group that had acted violently against Roman authority. Some scholars posit that he was a member of the Zealots or of the sicarii (dagger-men), militant Jews that sought to overthrow the Roman occupiers of their land by force. Like Barabbas, Jesus of Nazareth was charged with treason against Rome. 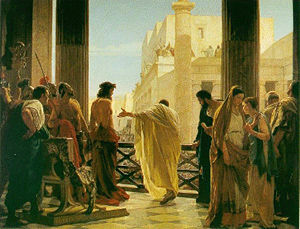 Shortly prior to his arrest, he had entered the Temple precincts to shouts of "Hosanna, son of David!" To Jews of the era, no clearer messianic declaration could be imagined. Not only that, but Jesus had immediately proceeded to a violent act against the authority of the Temple, overthrowing the tables of the money-changers and disrupting the trade for sacrificial offerings needed during the Temple's busiest holiday, namely Passover. This had prompted the high priest's party to move against Jesus, bribing one of his disciples to betray him and arresting him at night at the Garden of Gethsemane. After a late-night religious inquisition at the home of Caiaphas' father-in-law (John 18:13), it was decided to hand him over to Rome on capital charges of treason. Barabbas had already been imprisoned with his fellow rebels, and now Jesus was bound and brought to the Roman governor's residence in Jerusalem. Thus, both Barabbas and Jesus came to find themselves facing the death penalty, with their fate in the hands of Rome's representative, Pontius Pilate. Although neither Jewish nor Roman sources speak of it, three gospels state unequivocally that there was a custom at Passover during which the Roman governor would release a prisoner of the crowd's choice (Mark 15:6; Matt. 27:15; John 18:39). The gospels differ on whether the custom was a Roman one or a Jewish one. Pilate offers the crowd Jesus instead of Barabbas. In any case, the gospels agree that the crowd, urged on by the high priest's group, demand that Pilate release Barabbas. Although John's gospel refers to the crowd as "the Jews," and Matthew makes an attempt to blame the Jews collectively for the choice, the question emerges as to the composition of this crowd and whom they represented. The gospels make it clear that the disciples of Jesus had all abandoned him when he was arrested, and even his chief disciple, Peter, denied him three times rather than being identified as his supporter. The insurrectionist Barabbas was thus much more likely to have disciples who were willing to risk being publicly associated with him. This group, possibly already planning to appeal to Pilate for Barabbas' release, would have made common cause with the high priest's faction to urge Pilate to free Barabbas. In the end, Pilate released Barabbas, leaving Jesus to his fate. Little if anything is known of Barabbas' life after he gained his freedom. It may be that the two men crucified with Jesus at Golgotha were among his followers. Although they are normally thought of as "thieves," crucifixion would not have been the penalty for mere robbery. Mark's statement that "Barabbas was in prison with the insurrectionists who had committed murder in the uprising," makes it likely that other Zealots besides Barabbas had been scheduled for execution. Although Barabbas himself disappears from the record, other insurrections followed. Pilate himself was clearly threatened by such events, for he was deposed by Rome for over-reacting to a Samaritan messianic outbreak a few years later. In the Book of Acts the Pharisaic leader Gamaliel refers to two would-be Messiahs who led revolts: Theudas and Judas the Galilean (Acts 5:36-37). 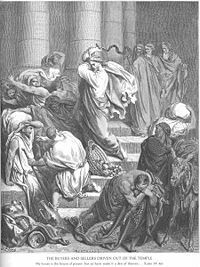 A generation later, the oppression of Rome had grown to the point where a major Jewish revolt broke out in 66 C.E., leading to the a full scale Roman invasion and the destruction of the Temple of Jerusalem. In the next century, a revolt led by Simon Bar Kochba succeeded in establishing an independent Jewish state briefly, although Jerusalem itself remained in Roman hands. In popular culture, Barabbas is variously portrayed as a patriotic rebel leader, a terrorist, or even a pseudonym for Jesus, since his name means "son of the father," and some sources indicate that his first name, like Jesus, was Yeshua. In 1961, Anthony Quinn played the title role of Barabbas in a popular Hollywood movie. Here, Barabbas is haunted by Jesus' innocent blood being spilled in place of his, and his life is never the same. The movie is based a story by Nobel Prize winning novelist Pär Lagerkvist. This page was last modified on 11 December 2016, at 19:48.